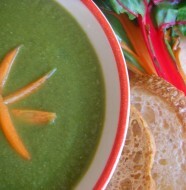 Acquacotta literally means “cooked water” and is one of the classic vegetable soups of Tuscany. 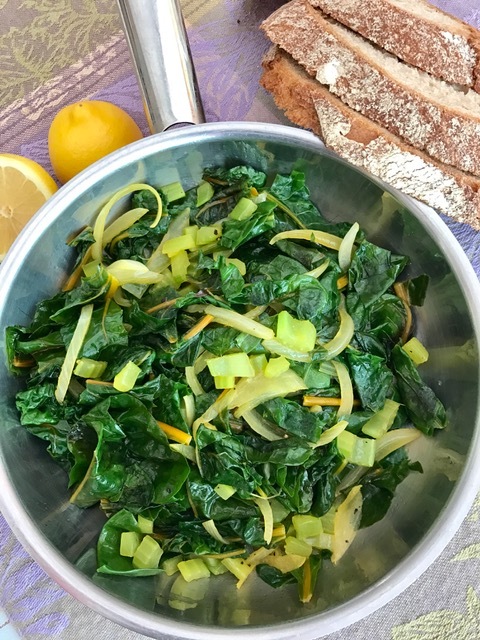 This dish is made with simple ingredients – chard, onion and celery. Acquacotta is served over fresh slices of bread and chilled white wine. You can’t ask for a healthier or more delicious appetizer! 1. Trim and discard the stems from the chard. 2. 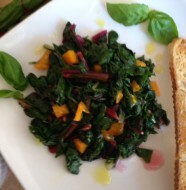 Cut chard leaves into 3-inch pieces wash leaves and spin-dry (do this 3 times to ensure all dirt particles are gone). 3. Peel the celery stalks and chop them into 1/2-inch pieces; set aside. 4. Peel the onion and cut it in half. Cut each onion half into thin slices. 5. In a 12-inch skillet, heat the oil on medium-high setting. 6. When oil is hot, add the celery and onion; stir-fry until onion is translucent and light golden. 7. Toss in the chard. 8. Using tongs, gently mix celery, onion and chard together. 9. Cook the chard mixture on medium-high heat until chard has wilted (it should look almost raw). 10. Add salt and ground black pepper, to taste. 11. Place the bread slices on a serving platter; divide the Acquacotta evenly over bread slices. Serve immediately.